It has been informed you through our earlier letters that Confederation had decided to conduct a day long Dharna action at Jantar Mantar Delhi demanding immediate Constitution of 7th Pay Commission, Merger of 50% DA to Basic Pay, Grant of Interim Relief etc. In the mean time we were eager to take up the LDC-UDC issue, which have been raising us for the last two years, in a larger platform and as such representatives of the Union/individual of LDC & UDC in various Departments were requested to come to the Dharna place of the Confederation on 9th January 2014. Prior to this, this Association has published a letter, in response to the comments posted in our web site on the subject, for discussion and finalization of the line of action to be taken to achieve the goal. Being a cadre issue Confederation has not been agreeing to include the LDC-UDC issue in its main charter of demands. But the popularity gained on the issue due to our efforts for quite some time has become a matter of attraction and rethinking by the Confederation also. In such a situation the presence of large number of representative of LDC-UDC in the Dharna would have been beneficial to impress the Confederation to add the demand in the main demands of the Confederation. But, unfortunately, except the representatives of the Association which have membership of LDC & UDC who attend the Confederation meetings regularly, no new unit/individual has participated in the programme. And yet, the issue of LDC-UDC have been discussed in the Dharna as well as the Extended National Executive Meeting on 10/01/2014 as several speakers including Shri M Krishnan, Secretary General Confederation termed the issue as genuine and pledged to support the fight. On the issue, Shri M Krishnan has advised me to prepare seriously for filing a case in the Principle CAT immediately. He further said that the Confederation knows genuineness of the demand, but we have to convince the importance of the issue to the Government. Simply adding this item in the Confederation Charter will not work at this later stage (at the stage of the constitution of 7th CPC). Thus, in order to convey the seriousness of the issue to the 7th CPC also, filing a case in the Court is essential as the CPC monitor all pending court cases of grievances in its own importance which ultimately would pave way for a better pay scale for the LDC & UDCs in the 7th CPC. In view of the above this Association is intending to file a case in the Principle CAT Delhi and two Kolkata based Associations are also interested to join us. In this connection necessary documents are being collected so that the case may be filed by March 2014. All members/readers are requested to keep the inspiration that given us so far continued. Please give your valuable suggestion through your comments, SMS, e-mail every stage to maintain our spirit to fight this genuine issue. I respect to you so much that you are considering for LDC/UDC employees benefits. My cooperation is always with you. Thank you sir for all your efforts. It would certainly going to pay all of us in near future. best of luck and we all are with you. Grand salute to your utmost dedication towards the removal of anomaly in the pay structure of ldx and udcs. Sir, i want to know the latest position of our stand in the instant case. Since, 7th cpc is in its final stage, it is very much essential that the concerned authority may issue specific orders revising the grade pay of ldc and udcs to Rs.2400/- and Rs.2800/- respectively with immediate effect. Sir, personally i feel that the authority also knows the genuineness of the issue and it may be in thier reference that some state govt. Had already revised the grade pays. However, the decision in favour of LDC and UDC is sufficiently delayed, it is most sincerely requested that all efforts may made to take up the issue to the PM to convey them how the authority is so arogant and ignorant on the matter which is devastating the lives of ldc-udcs. This has to be treated as do or die manner. Enough time and patience has been tested by the DOP&T and other authority. We are working for govt of india and partiality behaviour to ldc-udcs cannot be tolerated by one and all clerical staff viz. Ldc-udc. I am sorry if i written somthing which i should not. But the frustration among ldc and udc is at its high. No one can make fun of this post. Sir, last but not the least..many thanx to you for your tierless efforts which made to realise the gravity of the matter to all. Pls. Lets us know the current status of the matter. Sir, LDC.UDC demand is most reasonable ...I request everybody to give their pressure on govt. to reach the goal...thank u sir.....Krishna. LDC,Election Dept.Yanam. This is a totally genuine issue. Trade of LDC is responsible one. LDCs are engaged in various correspondence. They require good knowledge of English, Computers rules and regulation. Grade pay of Rs 1900 is unjustified and should be increased to Rs 2400. I thank all who all are fighting for this. I request to give update if any on this issue here. My objection is that even Jr.Engr few grade b&c officer are qualification is graduation but the grade pay n entry scale is 9300/- but UDC entry grade is ₹5200/- where d qualification is graduation..where is d fair fixation for us. 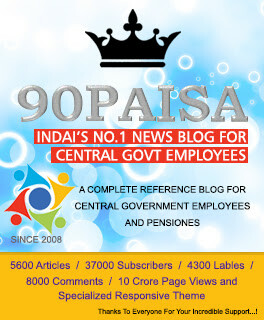 We are proud of our latest accomplishment – 90Paisa Blog, the first ever blog for Central Government employees, has now crossed 10 crore hits!!! From the bottom of our hearts, we express our sincere gratitude to all our patrons who have been supporting us all along. 90Paisa - Dedicated to Central Government Employees and Pensioners. As and when orders amending the rules are published by the Government, the amendment orders will be published in our blog immediately. Readers are requested to refer to the source link is given at the end of the post. All efforts have been made to ensure accuracy of the content on this blog, the same should not be construed as a statement of law or used for any legal purposes. 90paisa accepts no responsibility in relation to the accuracy, completeness, usefulness or otherwise, of the contents. Users are advised to verify/check any information with the relevant department(s) and/or other source(s), and to obtain any appropriate professional advice before acting on the information provided in the blog. Links to other websites that have been included on this blog are provided for public convenience only. 90paisa is not responsible for the contents or reliability of linked websites and does not necessarily endorse the view expressed within them. We cannot guarantee the availability of such linked pages at all times. Government is Contemplating to Increase Fitment Factor from 2.57 to 3.68 under 7th CPC?